Pamper yourself at The Scratching Post. Relax in the dry sauna. Wrap yourself up in the seclusion of the Nantahala Forest. Roast marshmallows around the fire pit. Cares drift away in the hot tub. 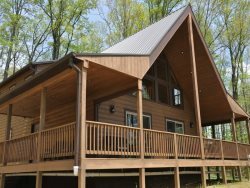 This luxury three story cabin is beautifully appointed with all the comforts of home. The large kitchen and open layout with plenty of seating make for easy entertaining and family gatherings. 3 Bedrooms, 2 Baths and 2 Half Baths: The First Bedroom has a King Bed. The Second Bedroom has a Queen Bed. The third bedroom has a Full over Full bunk bed. There is also a Queen Sleeper Sofa. One bathroom has a tub and shower combination. The second bathroom has a shower stall. Warm yourselves in front of the fire or relax on the expansive deck and enjoy the sounds of nature. The loft sitting room area is perfect for enjoying a favorite television show or movie, or quiet time with a great book. Bar-B-Que on the outdoor deck and enjoy dinner there year round with an outdoor heater. Toast s'mores around the fire pit and then soothe away the day in the dry sauna or sparkling outdoor hot tub. Every person I spoke with was amazing! The cabin was beautiful and extremely clean. It was so peaceful, the perfect getaway for my wife and I. This cabin was absolutely perfect! I have always used a different rental company but because of your staff and this cabin, we will use Great Smokys Cabin Rentals from this point forward! We started off trying to reserve through AirBnB, but the whole process was much easier and quicker when we went directly through their office. Their team is a big asset, as they were very helpful, professional, and a pleasure to speak to. We loved the location and all the games, the owners of this cabin thought of everything! It was perfect! Housekeeping did a fabulous job prior to our arrival. When I booked this vacation I thought I was getting a nice small getaway. I arrived to a beautiful paved driveway that led almost to the top of the mountain lead to a secluded, but not off the beaten path, log cabin. Extravagant countertops, up to date appliances, gas logs, indoor spa, hot tub, and the arcade were well appreciated. Above all though was the peacefulness and serenity of the back porch where we grilled on the gas grill and congregated around the fire pit. If you are looking for a real vacation, a family vacation, or just want to get away, these are the guys to talk to. The cabin was pristine! We loved the porch and the gas cooktop. We had a great Thanksgiving family trip! We had a wonderful family vacation! The Scratching Post was a great retreat for our family and just was a great balance of amenities and country cabin living! The hot tub, fireplace and outside fire pit were the focal points after long treks in the National Forest. The arcade style video game player was awesome with the throwback games. The hot tub was a great relaxation spot after hiking in the National Park all day. We loved The rustic feel of the cabin with the fireplace. The kids were able to play board games/ watch a movie in the loft area while the adults visited in the living room near the fireplace. Thank you for letting us bring our pets with us as we escaped Hurricane Florence. This beautiful cabin is jut what we needed in these stressful times. The house was well stocked. Cathie was great! Beautiful cabin, peaceful surroundings, great location. Loved the rocking chairs and Hot Tub! Went to Deep Creek, Tubing, rafting at Nantahala. Best memory was relaxing with friends. The kids loved the arcade, board games, fire pit. We are definitely coming back! The property was extraordinary!! It was peaceful and quiet and very excluded... the winding roads were filled with twists and turns that left me in awe. If rocking chairs and a warm fire is your idea of fun this would be the cabin for you!! Overall though the amenities were great. Grand kids had a great time. We went on the Railroad, white water tubing, hiking, Biltmore House, Cherokee, downtown Bryson City, Fly fishing Museum. We loved the fire pit and hot tub. Cathie was very helpful and informative. We had so much fun spending quality time with the family. Enjoyed whitewater rafting, train ride and Cherokee. Great fireworks for 4th of July and daytime activities in Bryson City! The cabin was very large and perfect for our family. Everything was great! We went horseback riding in Bryson and visited all the little shops. We really enjoyed spending time at the cabin. You guys have an amazing home. It was a great spring break. at your home with all the wonderful things around. The stay was comfortable and everything we expected and much more. Thank you for your awesome home! We had a wonderful time in this gorgeous cabin! It has inspired us to build one of our own! The cabin was very clean, we loved the area! Our family stayed for a Thanksgiving in the mountains. We had a lot of fun and made lots of memories. The kids enjoyed the Hot Tub and Game room. The cabin experience was fantastic and wonderful! This was home sweet home for us who are from China and studying at the University of Missouri. Love the great smoky mountain which brings wild animals. We will have beautiful memories for years to come. Any of the ladies I spoke with on the phone were polite and helpful. They were able to answer any of my questions. From the second we arrived we felt at home at The Scratching Post. We explored every inch of ground between here and Gatlinburg. Hiking, fishing, craft beer, and white water rafting. We left our mark on the Smokies. Coming home overnight Coming "home" to this immaculate mountain getaway. Thank you for having us. We are sure to return. We had a great stay here at The Scratching Post. Fun was enjoyed by all. The cabin is great, clean and we had everything we needed. We enjoyed biking, white water rafting, paddle boarding and boating. Great Trip!! !